Welcome to #Choctoberfest, a week long celebration of Chocolate. 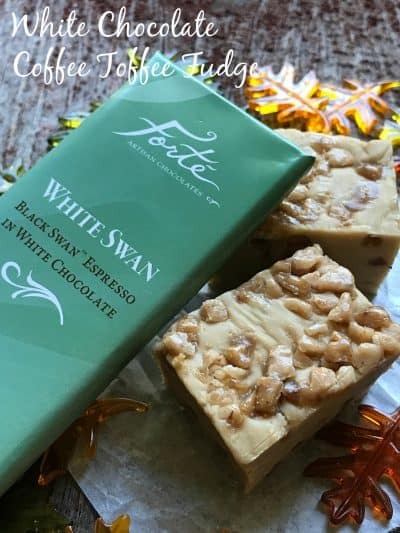 White Chocolate Coffee Toffee Fudge is probably my favorite fudge. I’ve made a lot of fudge in recent years. In fact it’s safe to say that I’ve been on a fudge ‘high’ the last couple of years. It seems every fall I get bitten by the fudge bug and make batch after batch of fudge. This might have something to do with the fact that I have a son-in-law who loves any and all kinds of fudge. 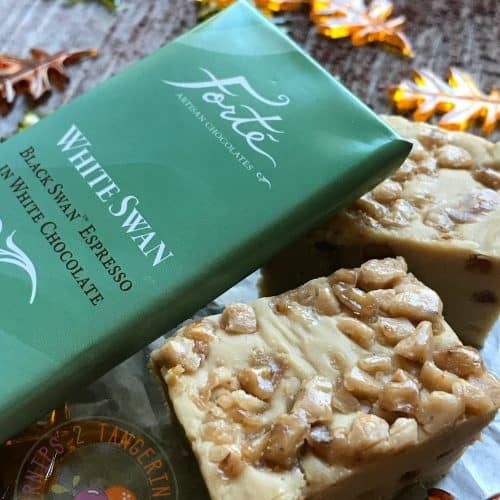 I have to agree with Fred, I almost kept this batch of fudge for myself but decided to give him half:) This fudge is made with Forte Artisan Chocolates, a #Choctoberfest sponsor. 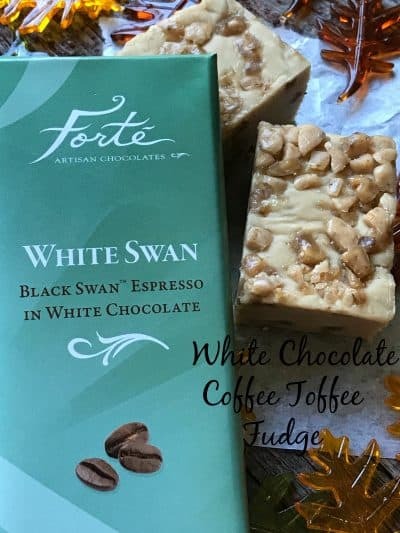 Forte White Swan Espresso Bar is an International Award Winner. 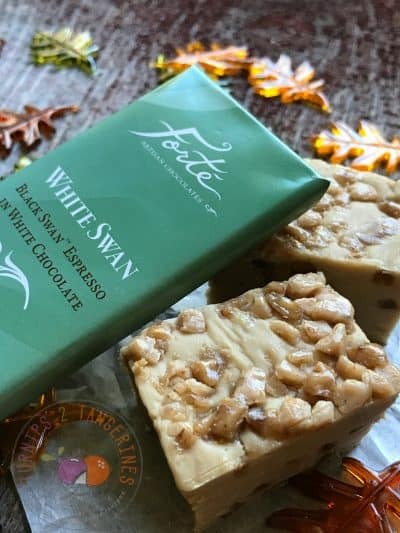 Silky smooth white chocolate is mixed with espresso by Black Swan Coffee Roasting Co. This extremely fine-ground espresso is made from a wonderful blend of Central and South American coffees. Recently, when my hubby was on vacation, we stopped at a local winery and did a little wine tasting. He was totally surprised when they asked him if he’d like to try a glass of Chocolate Wine. Personally, I love Chocolate Wine. It reminds me of a succulent cream liqueur. If you’ve never tried Chocolate Wine, pick up a bottle or stop at a local winery and sample a glass or two. We sampled chocolate wines at Three Lakes Winery in Three Lakes WI. Chocolate Wine is my favorite. We splurged and-6+ bought one bottle of each flavor. ChocoVine Raspberry, ChocoVine Original, ChocoVine Dutch Vanilla, ChocoVine Dark and ChocoVine Pumpkin Spice. 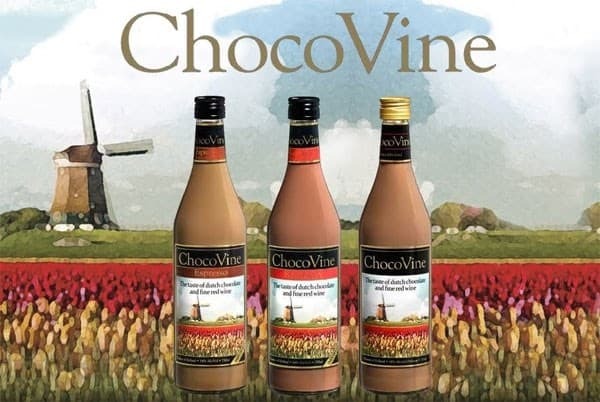 ChocoVine is made with Dutch Chocolate and is Imported from Holland. Serving Suggestions: ChocoVine on the rocks, in an array of sinful cocktails, poured over ice cream or in an ice cream blender drink. 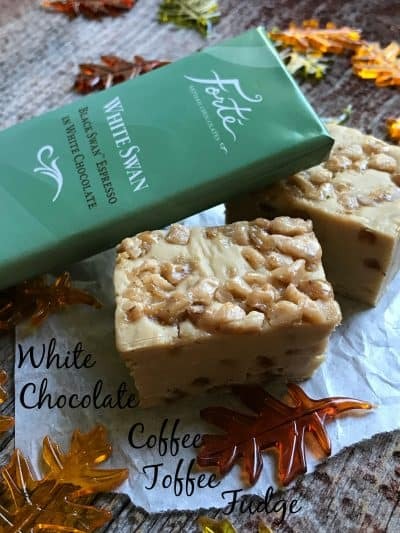 A delicious white chocolate, coffee flavored fudge laced with toffee chips. Combine sugar, evaporated milk, butter, salt and instant coffee crystals in medium, heavy-duty saucepan. Bring to a full rolling boil over medium heat, stirring constantly. Boil, stirring constantly, for 4 to 5 minutes. Remove from heat. Stir in marshmallows, white chocolate chips, white swan espresso bar and vanilla extract. Stir vigorously until marshmallows are melted, stir in bits-o-brickle. Pour into prepared baking pan; sprinkle top of fudge with 2 tablespoons bits-o-brickle, lightly press down. Refrigerate for 8 hours or until firm. Lift from pan; remove foil. Cut into 48 pieces. More Recipes for Fudge: Maple Nut Fudge, White Chocolate Blueberry Fudge and Candy Cane Fudge.